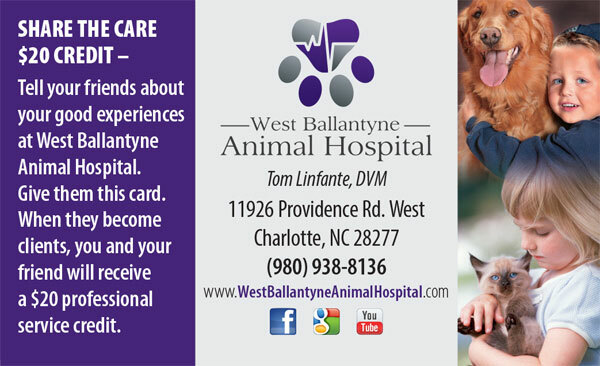 At West Ballantyne Animal Hospital we love seeing new faces, whether they belong to people or pets. If you know someone who doesn’t currently have a go-to veterinary hospital, we’d love it if you sent them our way! Client recommendations are an important way for us to keep the doors of our business open to the dogs, cats, and pet owners of the Greater Charlotte metro area. That’s why we like to reward recommendations with a discount for both you and the new customer you refer. Send someone to our veterinary hospital and you will both receive $20 off your next professional service, including anything from spay/neuter for cats or dogs to digital radiology to dog grooming services and more. We are the professional, compassionate veterinary hospital that can do it all, and if you’ve been here, we’re sure you’ll be able to tell your friends about everything we have to offer. Simply print out the above Share The Care coupon to give to a friend, or pick one up during your next visit!